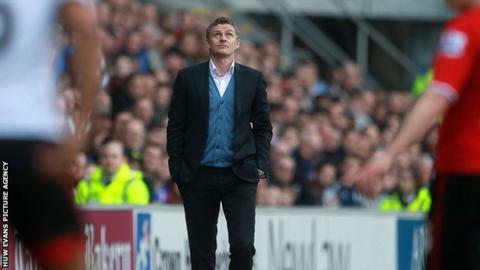 Cardiff City manager Ole Gunnar Solskjaer is demanding "leadership and loyalty" from his players in their Premier League relegation battle. Saturday's 3-0 home defeat by Crystal Palace leaves the Bluebirds second from bottom with five matches remaining. Solskjaer said "most of" his players have the right attitude - and they will be the "ones that are involved". The 41-year-old Norwegian added: "I need players with calmness, belief, leadership and... loyalty." The lame nature of the Bluebirds' capitulation against fellow strugglers Palace led to tough questions for the former Manchester United striker in the post-match news conference. Asked if he had been upset by the attitude of some of his players, Solskjaer said: "Yes. In training and in games you have plans, you have strategies and you follow them, OK?" Solskjaer, who was appointed manager in the first week of January following the sacking of Malky Mackay, admitted the defeat was a major blow. "Psychologically, it is a proper kick in the teeth," he said. "But I have got lots of fight, I have got loads of belief. "I know the players and they deserve to hear that I still believe they can do it, because I see them every single day. Most of these are fantastic." Solskjaer admitted the season, Cardiff's first in the top flight for 51 years, had been "very draining" mentally for the players. He said: "Their heads dropped, we ran out of ideas. It is going to be hard to pick them up, but we have to find a way. Can we produce a miracle? That is what we have to do." Cardiff will go to the bottom of the Premier League if Sunderland secure at least a point in the first of their three games in hand, against Tottenham on Monday.